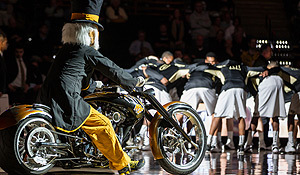 Starting Jan. 7, Wake Forest staff may register online for a lottery to win free tickets to a men’s home basketball game against Georgia Tech and a special pre-game “tailgate” lunch. The University’s Staff Advisory Council is organizing the staff appreciation event set for Feb. 16. The SAC is offering up to two free tickets to the game and tailgate to staff members through the lottery, which will run from Jan. 7 through 15. Those awarded tickets will be offered an opportunity to purchase up to two more tickets at a reduced price of $10 per ticket for other family members.